Arranged Marriage by Chitra Banerjee Divakaruni was on my wish list for a long time, especially since I had read a small excerpt online. So, when I finally spotted the book lying supine on library shelf, I could hardly resist myself from picking it up. But, as it turned out, Arranged Marriage is not a novel but a collection of short stories, and since I was a little disappointed with the framework of One Amazing Thing, I was somewhat apprehensive. Though, all my doubts were laid to rest as I began reading. Arranged Marriage is a collection of eleven stories, covering almost all the aspects of marriage, be it first love, demanding kids or the unsatisfied couple quitting their relationship to search for newer pastures. The stories are diverse in theme, characters and narration, and yet bound together by the common thread of marriage. Some of these stories talk about the steady love that glues a couple together while others expose the misplaced trust a woman places in her violent husband. And, still others revealed the bitter sweet relationship a wedded duo enjoys. 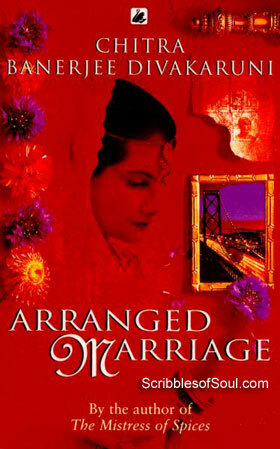 In short, almost every aspect of marriage is dealt with in the span of just 300 pages by Chitra. I loved almost all the stories, some for their strong symbolism and others for exposing the hard hitting truth hidden behind the veil of privacy. Though, the stories are best enjoyed when read on your own, I just can’t resist the temptation to tell you a little about them :). The very first story The Bats is about a young girl, daughter of an abusive father and reluctant mother. An excerpt of it I had read a few months ago that made me hungry for the entire book. Though, initially I was skeptical about the choice of a kid as the main protagonist in the very beginning of a story collection called Arranged Marriage. But as I finished, I realized that Chitra has very smartly used the kid’s innocence to enhance the contrast with her parents’ broken marriage. As in Vine of Desire, I found beautiful metaphors here too. Dead bats were used as a powerful symbol of misplaced trust. As the bats return to orchards despite poison, so did the mother trust his abusive husband again and again only to be thwarted once more. The analogy shook me especially as the small child was able to make a connection while the adults remained oblivious. I kept remembering Prince Muishkin who said that children understand everything. They may react differently but that hardly overrules their ability to comprehend what we consider adult situation. The relation between girl and her aged uncle was also very beautiful and heart warming. The simple pleasures of village life floored me. Strangely, no names were used and still I did not notice it till the end. This strategy of not naming the protagonist was earlier effectively used by R. K. Narayan in Naga and here also I loved it. In short, the beginning of the book was superb. Then, came the second story Clothes, revolving around a young village woman who goes to California after marriage with a store owner. But things turn out to be bleaker than expected. Though, Mita is able to adjust as happens in most Indian marriages, but still, she yearns for a little privacy as the house is too small, earning too less. The story was quite reminiscent of insecurity and uncertainty, every newly wedded woman has to cope up with. Here, an added strangeness of a new country enhanced the heroine’s troubles. Again, symbols were used abundantly, beginning with the title clothes itself. The symbolism began early, with the sensuous Mita bathing with her sari floating around just like her nascent dreams, followed by emphasis on red color in the sari of bride viewing and wedding. And, finally clothes represented the high hopes of husband with his wife dressed in the modern skirt, only to be later broken by the monotonous white. Awesome story with just the right amount of happiness and sorrow. Chitra has always used a high dose of metaphors and symbols in her stories. But in the story Doors, she has broken all previous records. How could a desire to have little privacy may break an entire marriage, was beautifully conveyed in this story. As the wife is an independent America born and bred woman and has never lived in a joint family, she struggles to accept her Indian husband’s tolerance for nosy friends. And just a closed door was able to thwart the love and nerves of the happily married couple. The doors was a wonderful metaphor, an insignificant barrier exposing the deep lying resentment! The Ultrasound was another great story of two friends, who get pregnant at the same time, and yet owing to different cultural settings, use Ultrasound for altogether different purposes. As I read the story, I could see the origin of Vine of Desire in it. Just like R. K. Narayan, Chitra is also able to play with the format of the story, expanding it to a full sized novel or reducing it to just a 10 page story! I noticed the impression of Chitra’s later novels in many stories in Arranges Marriage. Be it the true friendship of cousins or the dark complexion bias or even the roving eyes of males, the familiar themes reminded me of her other books continuously. And, one of the most recurrent theme in Chitra’s novels is the fascination for American dream, that continues with Silver Pavements Golden Roof, where a young girl is able to get to Chicago to attend college, escaping from dreary streets of Calcutta. But, slowly she is disillusioned with the riches of America and the anomaly in her aunt’s marriage (literally a nymph married to an ogre). In a hard hitting manner, the story revealed the imperfection of aunt’s perfect marriage and the true face of racism suffered by Indians on foreign land. And, in a masterstroke, Chitra blended these two diverse themes, creating an almost similar storyline of Queen of Dreams, only more poignant and briefer. I kept remembering Leo Tolstoy’s famous words that the secrets of marriage are known to only those involved, but in the hands of a master storyteller, we do become privy to characters’ innermost thoughts, sharing their griefs, enjoying their laughs. And, throughout the book, I was indeed involved with sentiments of well thought out characters and their actions and reactions to life. Chitra based almost all the stories in America featuring disillusionment at various levels. Be it the harsh reality of racism in ‘Silver Pavements Golden Roof’ or the inability of an Indian girl to digest her mother’s displeasure at her live-in relationship in ‘The Word Love’ or the shock Asha received in ‘Meeting Mrinal’, on knowing that the life of her old friend is as distraught as her own. The stories begin as simple, superfluous ones related with marriage or relationships in general, but soon scratch below the surface and turn out to be deep reservoirs of thoughts and emotions. It is really difficult to pick a favorite story out of this well prepared bouquet of exotic flowers of myriad hues. But, still the longest story The Maid Servant’s Story impressed me the most. It was an amalgamation of varied moods, settings and emotions. The story begins with an awkward relation between a strict mother and her soon to be married America educated daughter. And, then is interwoven a long forgotten story about a maid servant, Sarla who is exploited by her greedy mother and genteel employers. As I read the story I wondered why is Deepa mashi telling the story of Sarla to her niece. Is it a pre-wedding parable or a reflection of her past? But, as I finished the story, I realized that Chitra has blended reality and sarcasm so perfectly that it is almost impossible to distinguish the two, a winning combination indeed! Another off beat story was The Disappearance, the only story which is written with the perspective of male protagonist. A man’s wife has disappeared. Whether she has been kidnapped, is lured by a stranger or has simply run away on her own, grappled me as well as the husband in question. But, slowly the hidden aspects of a supposedly perfect marriage were revealed, as the man tries to find out the reality. Though, he fails miserably as he is just not able to understand the needs of his wife. To Chitra’s credit, she was able to present the absent wife’s views in the husband’s monologues. Easily, the best story as far as the technique of soliloquies is concerned. Earlier also, I was impressed with strong narration and use of literary techniques in Chitra’s books. But, in Arranged Marriage, she is at her best. She has even experimented with the voice of protagonist. I have nowhere seen the use of second person pronoun as emphatically as in ‘The Word Love’. The use of strong ‘You’ was both emphatic as well as revealing. Similarly, the first person narration in ‘Bats’ and ‘Affair’ was as suitable as was the mingling of first and third person in ‘The Maid Servant’s Story’ and ‘The Perfect Marriage’. Often Marriage is described as a blessed union of two souls, happily ignoring the hardships of a life long commitment, the hazards of living with a man of your exact opposite nature, making small and big compromises with or without your consent, while inwardly hoping to let things be alright by themselves. But, as a coin has two sides, one side can never be overlooked in preference to the other. I believe, both aspects of marriage are equally important. Though, most novelists try to paint either a fantastically beautiful or a grim ugly picture. But, Chitra Divakaruni has tried to strike a balance between the two in her book Arranged Marriage and has done so with style. After being an ardent fan of Chitra courtesy Sister of my Heart and Vine of Desire, my expectations were sky high, and as I finish the book, I am more than satisfied and even more hungry to read her new novel, Oleander Girl.